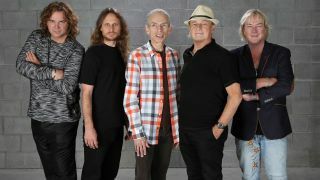 Yes have outlined plans for a weekend of celebrations in London to mark their 50th anniversary. The series of special events – sponsored by Prog magazine – have been planned to coincide with the band’s shows in the city on March 24 and 25, with a fan convention to take place on the afternoon of the 25th at the London Palladium. Raffle of Yes collectables, with money raised going to charity. Further announcements will be revealed in due course. Tickets for the convention are priced at £30 (plus booking fee) and there’s free entry for those who have purchased Meet & Greet packages for Saturday or Sunday shows. All profits from the convention will be donated to two charities: The Christie Hospital in Manchester and Kangaroos, whose aims are to enhance the lives of special needs and disabled children. Yes will kick off their 50th anniversary UK tour in Bristol on March 13. Find a full list of dates below. Subscribe to Prog and save up to 49% this Christmas!